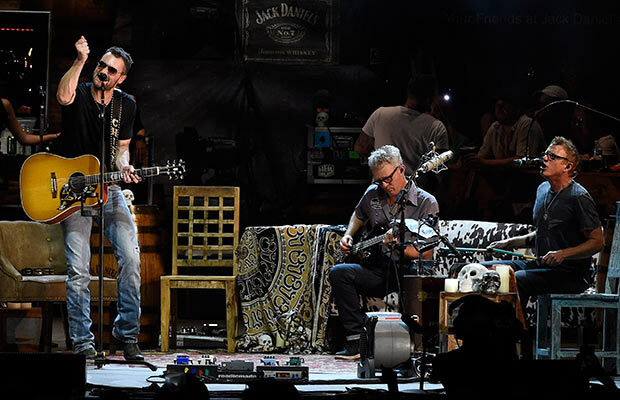 NASHVILLE, Tenn. – (July 31, 2015) – Even by Eric Church’s ever-expanding definition, Thursday night’s show under a full moon to open Nashville’s brand new Ascend Amphitheater was different. Maybe even a little weird, country music’s road warrior told fans. Full of deep cuts, improvisational arrangements, a few lyric slips, a never-before-heard new song and lots of laughs, the set was reminiscent of the solo outing Church played earlier this year in Salt Lake City when most of his band fell ill due to a virus on The Outsiders World Tour. Church built “The Outsider’s Joint” on stage, complete with bars and bartenders, friends and band members seated along his playing space, and a cowhide couch. He invited band members Jeff Cease, Joanna Cotten, Lee Hendricks, Jeff Hyde, Driver Williams and Craig Wright on stage individually Thursday night as accompaniment as he worked through some of his biggest hits and favorite album tracks. After J Roddy Walston and The Business opened the night with a high-energy set, Church walked onto a darkened stage while working a solo jam on his guitar as he leapt into “Smoke a Little Smoke,” then played most recent No. 1 “Talladega.” After that, there was no set list or road map. The singer-songwriter thanked the crowd for allowing him to play his songs simply, as they’d first been written, before the studio veneer was added. He then rewarded fans with a song he’d never played live before called “Three Year Old” about the wonderful travails of fatherhood. The song got its start on a fishing trip during which his son threw both his rod and reel and tackle box into the water. “I’m 38, and I never knew a fishing rod sinks faster than a tackle box,” Church joked. As for Friday night, Church promises something completely different. Stay tuned. Church’s pop-up store, The Outsider’s Joint, remains open through Saturday in East Nashville. The store’s first appearance during CMA Music Festival was a huge success with more than $20,000 going to Church’s Chief Cares Fund. The pop-up store offers official merchandise as well as These Boots by Lucchese, Church’s custom boot line usually only available to VIP ticketholders. The pop-up shop is located at 218 South 11th Street in the 5 Points area of East Nashville across from the Bill Martin grocery store. Park at LP Field and receive a free ride to 5 Points (excluding tip) from JoyRide by calling (615) 285-9835 or use Uber code OUTSIDERS for $20 off your first ride. While there, a handful of local restaurants have special food and drink offers for those with Ascend Amphitheater tickets. Pop-up store hours are 12-6 p.m. Friday and 10 a.m.-2 p.m. Saturday. The Country Music Association and four-time Academy of Country Music Award winner finished 2014 as country music’s top-selling artist, with the year’s highest debut and sales of any release in the format as the critical and commercial success The Outsiders reached Platinum status, marking more than one million albums sold. Debuting at No. 1 on both the Billboard Top 200 Albums Chart and Top Country Albums chart, “The Outsiders” garnered GRAMMY, CMA and ACM Album of the Year nominations and features his No.1 hits “Give Me Back My Hometown” and “Talladega” as well as his current single “Like A Wrecking Ball.” The Outsiders is the follow-up to Church’s Platinum-certified Chief, named the 2012 Album of the Year by both CMA and ACM, and GRAMMY-nominated for Best Country Album. The LP featured five Top 20 singles: “Homeboy” (certified Platinum for sales in excess of 1 million); the Top 10 “Like Jesus Does” and the Top 5 “Creepin’” (both certified Gold for sales in excess of 500,000); and two No. 1 hits “Drink in My Hand” (certified Platinum) and “Springsteen” (certified Double Platinum for sales in excess of 2 million singles). Church’s 2006 debut album, Sinners Like Me (2006) and his sophomore album Carolina (2009) are both RIAA Gold-certified. 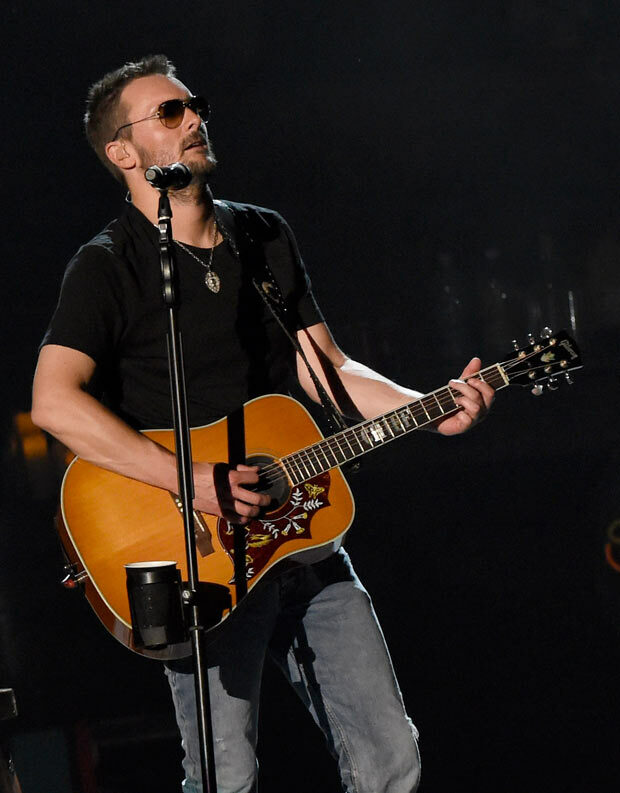 The Country Music Hall of Fame and Museum also just announced their new exhibit, “Eric Church: Inside The Outsider,” will open in September 2015. For more information or tickets, visit www.EricChurch.com or on socials @ericchurch.